Met June 5th, 2018 at the Hall at 1204 30th Ave, Vernon BC. President Jerry Morrison opened the meeting at 7:05 PM. Note-taker was Cal Olsson. 26 members as well as 1 guest: Craig Glenn from the Kelowna area. The minutes of the last meeting were read and adopted by a show of hands. Don`t forget to set time aside to attend Lumby days this year; should be a fun time. It`s this coming weekend. Sat. and Sun. There is free camping, get in touch with Pat Yonkman, ph.# 250-546-6510, to register. Usually arrive on Friday and camp through to Sunday. Saturday morning is the big parade and pancake breakfast; President Gerry is looking into getting Ted Turner to haul us in his fire truck as a float. Letter from Capri Insurance asking for inventory list of club values; the tangible kind. Membership Report by Donna Smith. 35 families are currently paid up members in good standing. There is a common dues due date of October first. Dues are $20.00 per year per family, Oct. to Oct. However there is half price deal if joining the club from May 1st. on till end of season. A huge hug of gratitude to all those wonderful volunteers who made this year`s BC Open Panning Event a wonderful success. Some of you went beyond the call like Kim Creed, Donna Smith, Jerry Stainer, Rick Peterson, Jean Dixon, Terry Regier, The Mathers family, Pat and Louie Yonkman, Mary and Ernie Erickson, The Lanthiers, the Bjerstedt’s, the Tkaczyks and so many others: thank you all; well done! We are just finishing up getting out all the prizes to the winners. Donna reported that Terry Nitchke won the free membership for those who filled in the BC Open survey. A lot of survey (questionnaire) forms of how they heard of the event were filled in and Donna and Ernie are assessing the result implications now. Here is how it broke down: 46 said word of mouth- 5 said newspaper- 4 said Other- 4 were Radio- 2 were not counted as they were not answered- 5 by internet- 1 walked to it by accident- 1 drove to it by accident- 1 by TV- 1 by Rivertalk paper- 1 on Salmon arm bulletin board- 1 was staying in campgrounds- 1 came before. It was gratifying to have a food vendor at the BC Open. Hopefully they will be back next year. If people have to go find food somewhere else then they just might not come back, so a food vendor was a fabulous idea. We need to look into buying gold for next year`s BC Open now. Mary Erickson is adding up what is currently on hand now. Jerry Stainer gave Mary a list of what we need in the future. There will be a speed panning event added to the BC Open itinerary next year. We are looking forward to a successful BC Open in 2019 on the May long weekend. Please find it in your heart to volunteer to help in 2019. Merv Mathers moved that the extra trophy be changed to the Presidents trophy with a list of all the club`s past presidents and current president plated on it. It`s to be presented to the Youngest entering gold panner at the BC Open. Seconded by Robin Jenner. Discussed, voted on and passed. 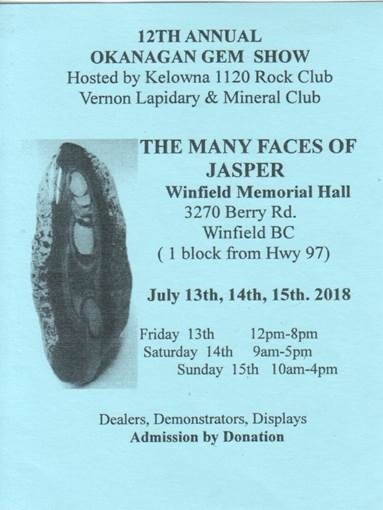 Karen McKenzie assured us that her husband Mike will be doing a `learn to pan` event at the 12th annual Okanagan gem show on July 13,14, 15 at the Winfield memorial hall. Anyone who will invest their time helping out would be appreciated. The BC Open gravel cleanup will be on July 21st and 22nd at Pat and Louie Yonkman`s place. Come out to the club`s annual picnic at the Spence’s Bridge community campground on August 11th and 12th. Condolences to Mike Spotten currently healing up a broken leg! Good to see Bill Allan up and about after having 2 stents put in since he had his heart attack at the BC Open. +++Donna wishes to thank everyone that made her last year a best year of sales at her tables. Be prepared to step up and take over her job at the donations tables. She says she will coordinate who goes to what sponsor or business for donations, and still do her share, but can no longer do the lifting required. Kim Creed and Donna were running a Lotto ticket thing for groups of us..first time, we won $20 and it was re-invested. Both Kim and Donna each tried once more on their own for the group…but alas, no winner. Louie Yonkman won the first nugget door prize, and Robin Jenner the second nugget prize. Michael McKenzie won the 50/50 draw $33.50. The President of the BCPMA and his wife Donna Dewaard are not with the Vancouver placer association now and so unable to be president and secretary of the BCPMA. In the interim until a new president can be elected the Vice President Jason Jacobs is acting President BCPMA. Jonathon Paul told us a horror story about his dealings with the ministry bureaucrats and a squatter on his claim that left a bunch of junk, and a broken down camper.